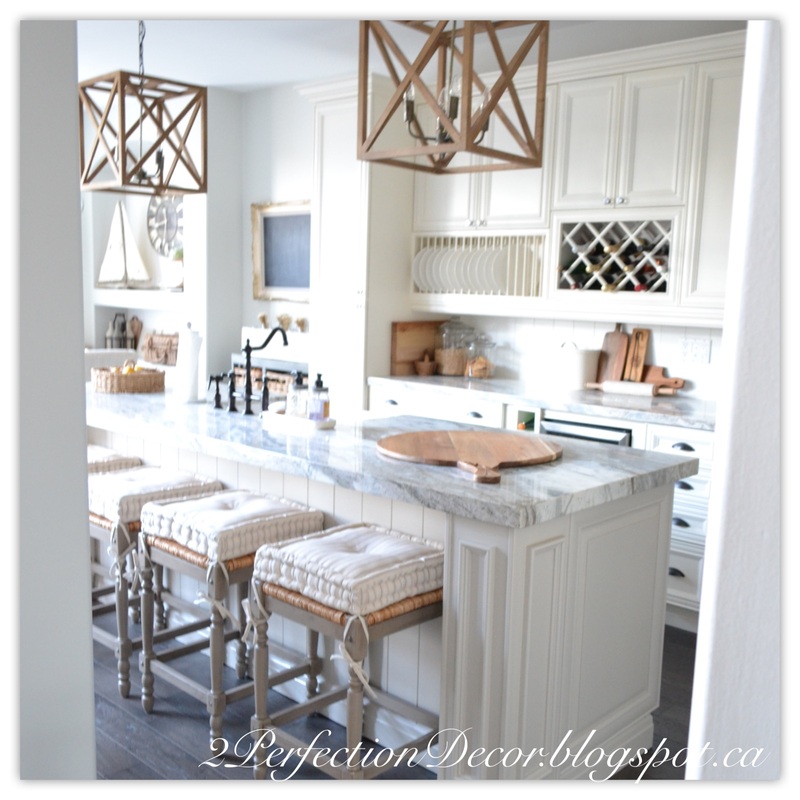 Our kitchen has gone through a MAJOR transformation.. When we bought this house I knew the orange cabinets really had to go. 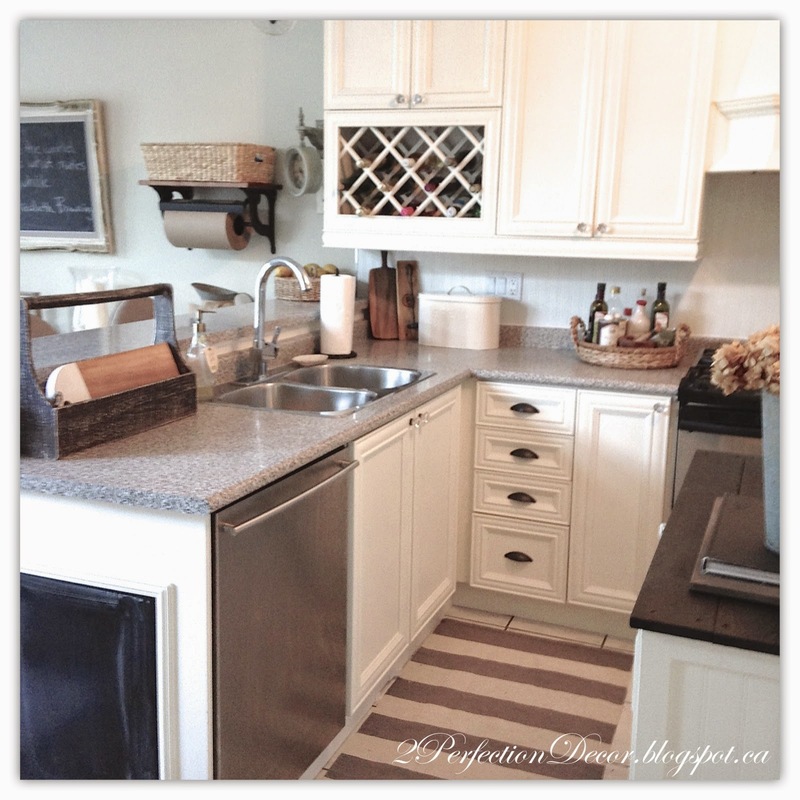 Ideally I would have loved to 'Gut' the kitchen and start over.. But I don't have an extra 60k so we choose to 'Tweak' it instead. 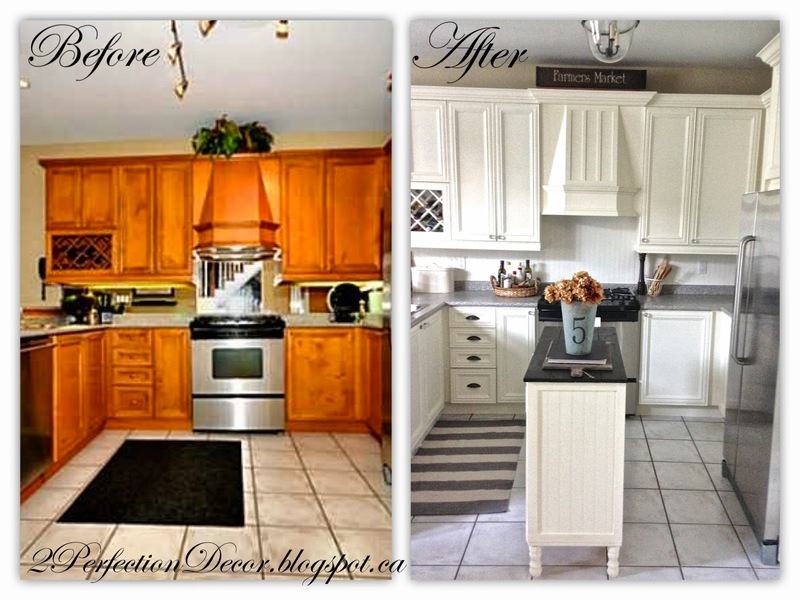 All together we spent $1800 to completely makeover this kitchen. 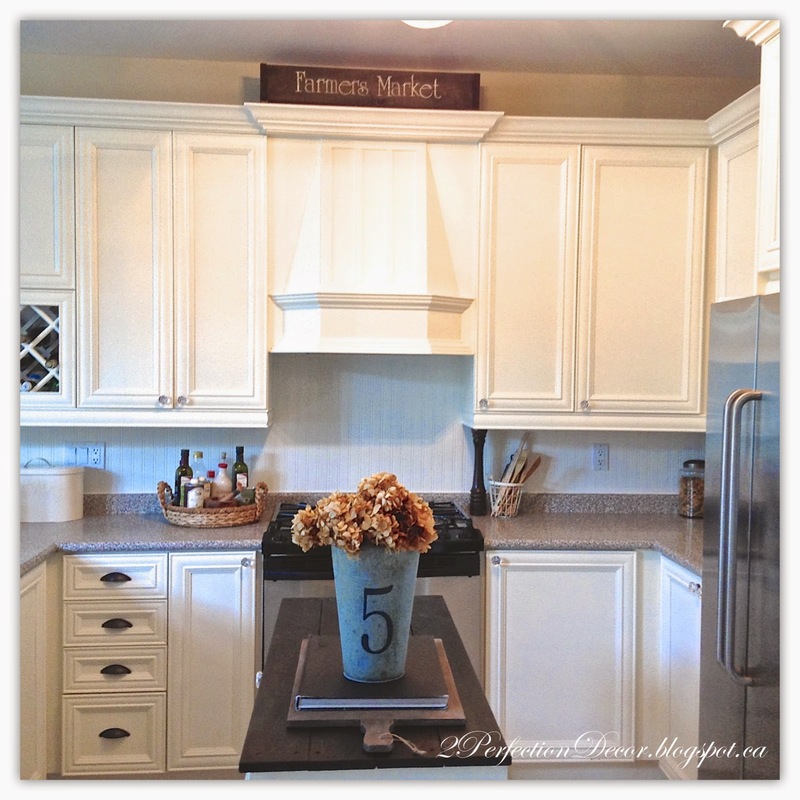 The cabinets were professionally Painted in Benjamin Moore Linen white. 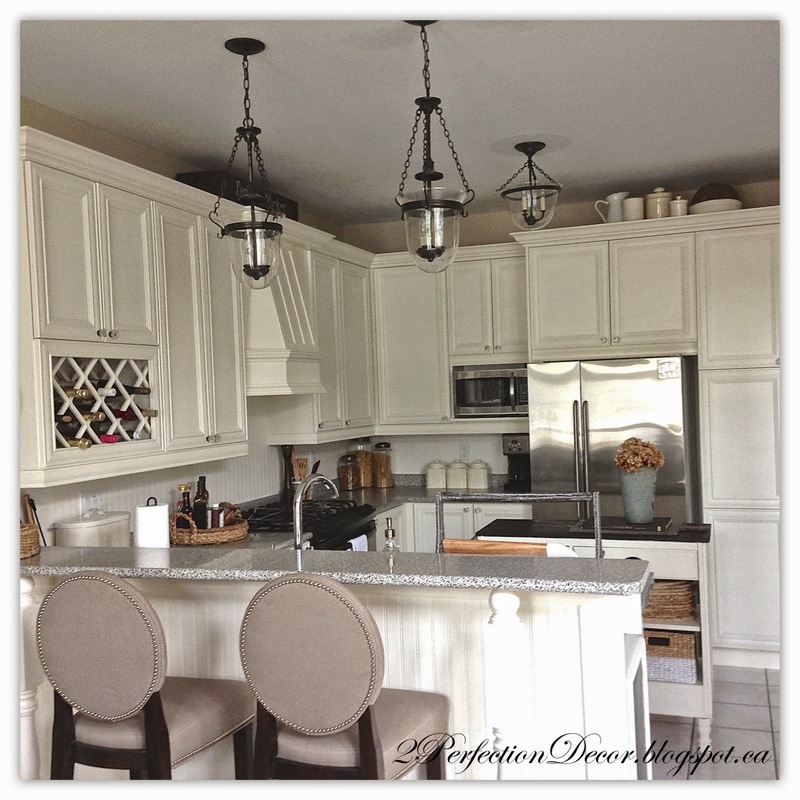 We added larger more pronounced Crown mouldings, Changed the cabinet Hardware and Added new Oil rubbed bronze Pendants and ceiling lights. 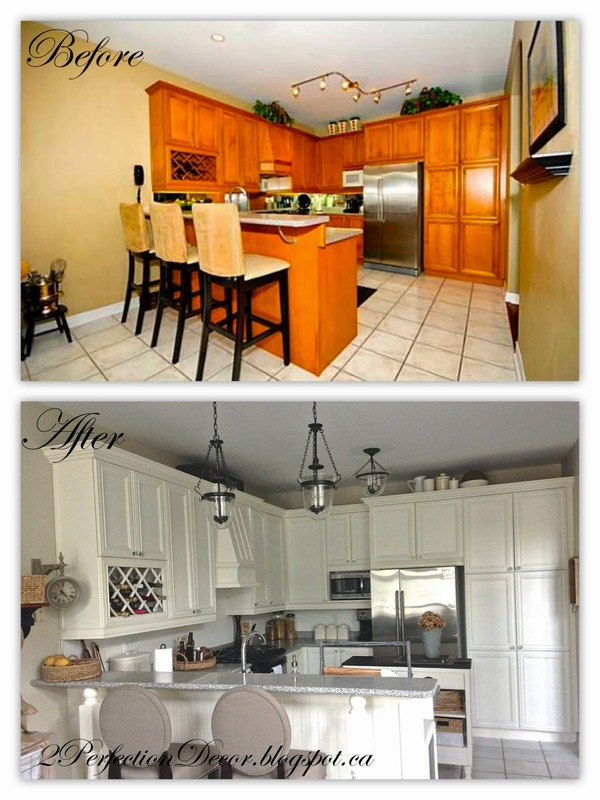 We had all the Kitchen cabinets professionally painted for $750. 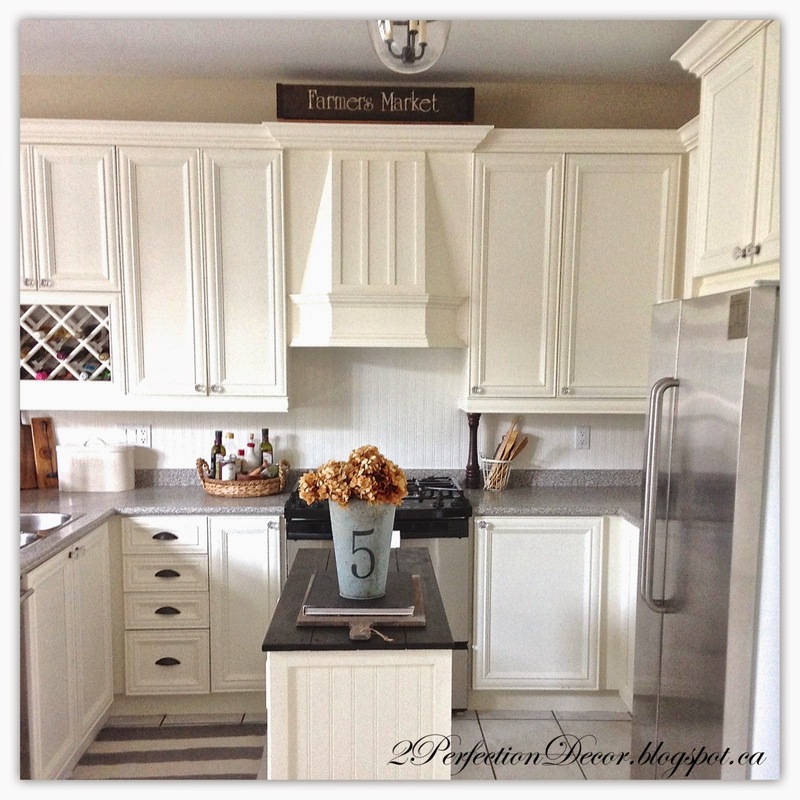 We choose Benjamin Moore Linen white, Its a light creamy white, Perfect for Freshening up the entire kitchen. 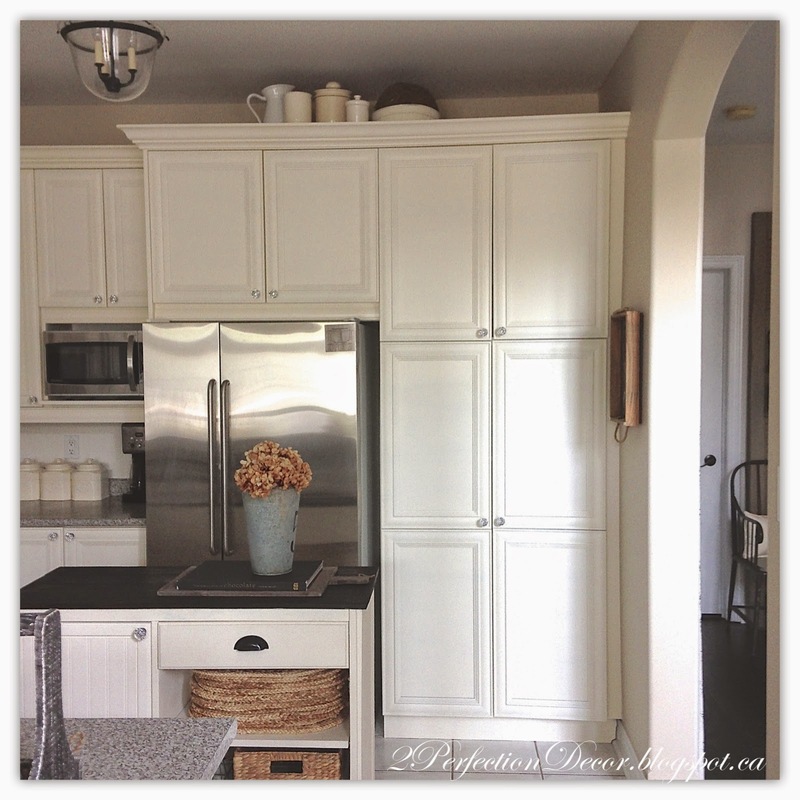 I debated painting the cabinets myself as I have painted cabinets in the past.. but with a new little one, and packing up our previous house I felt it was best and EASIER to pass it off to the professionals. Plus the price was very reasonable considering they take the doors off and spray them front and back. And then re-install them for you. Yay! I just LOVE how it all turned out!! 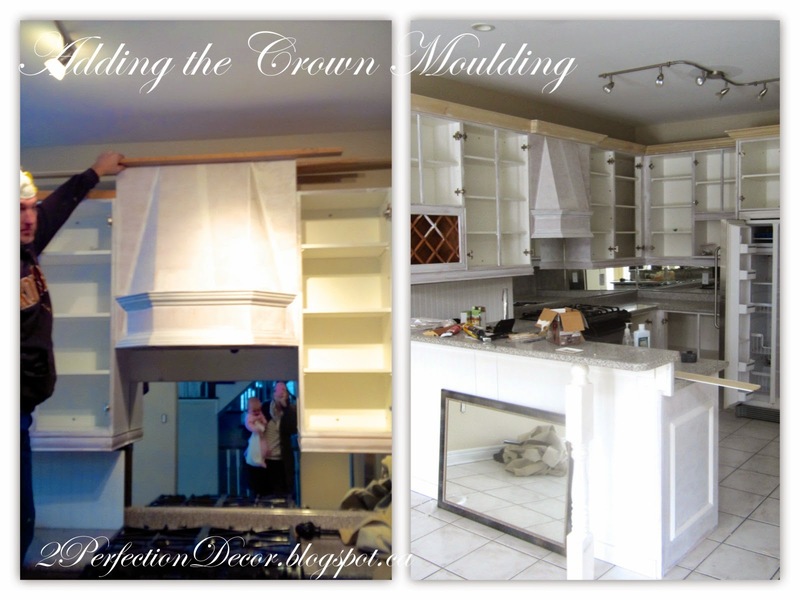 This is how it looked in the middle of the Reno's..Since we were already adding all new larger crown mouldings we decided to raise the Decorative Hoodfan for a more detailed staggered look.. BUT we ran into a bump in the road.. because the current decorative hood fan wasn't protruded enough.. it budded right up to the cabinets ..we were unable to connect the crown to it.. Sooooo we lowered the hoodfan back down to its originally spot and added a thin piece of wood under it , so that way when we added the larger crown all around the cabinets we ended up achieving the detailed look I was going for. We had electricians add lights above the kitchen breakfast bar. When we purchased the house it only had 1 pot light on the left side above the breakfast bar.. It looked very random?? 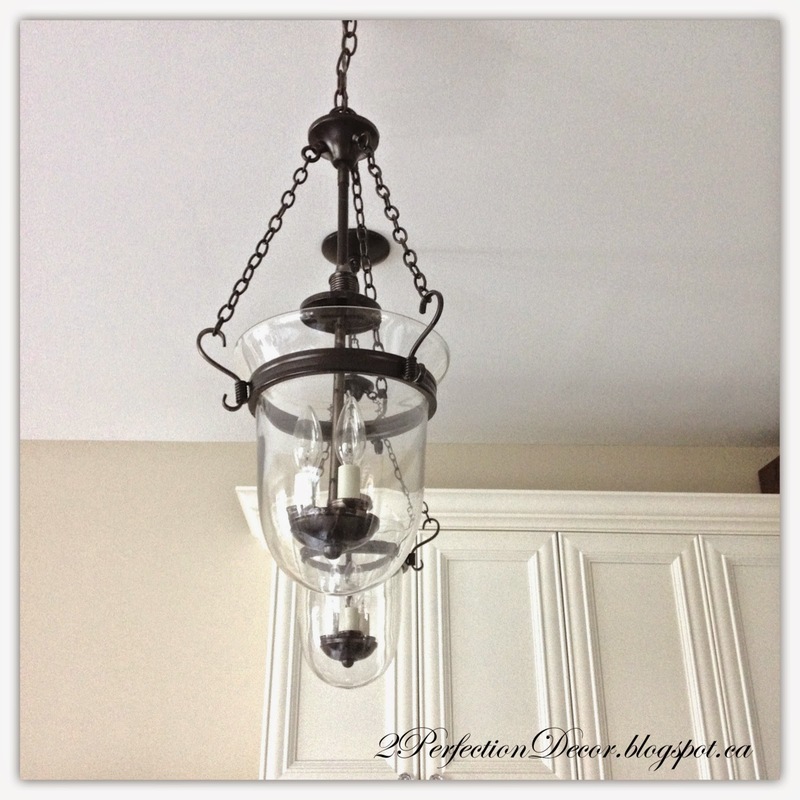 The pendants lights are new from Home depot , they were originally a satin nickel colour, we spray painted the metal Oil rubbed bronze. They look like ones I wanted from Pottery Barn but were out of my price range. To add a little French Country flair and draw the eye upward to our new crown, My husband made me a Vintage looking Wood box and I stencilled it with the words 'Farmers Market'. 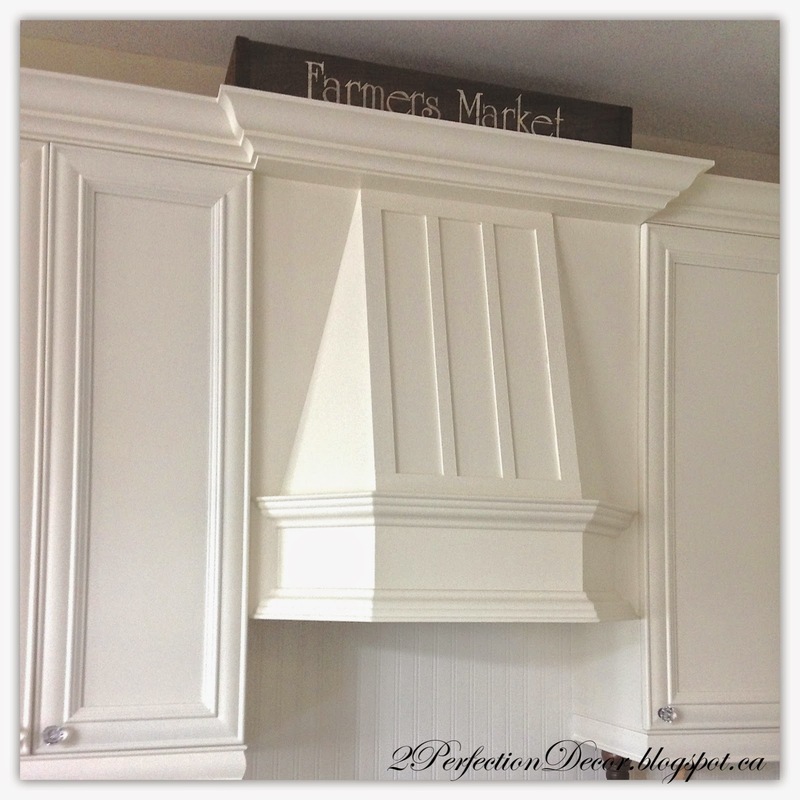 We trimmed our decorative hood fan to create a pannelled look. We got thin wood strips cut at our local hardware store. The outer box detail is made of 1 1/2 inch wide wood strip pieces, with two inside strips measuring 1 inch wide. 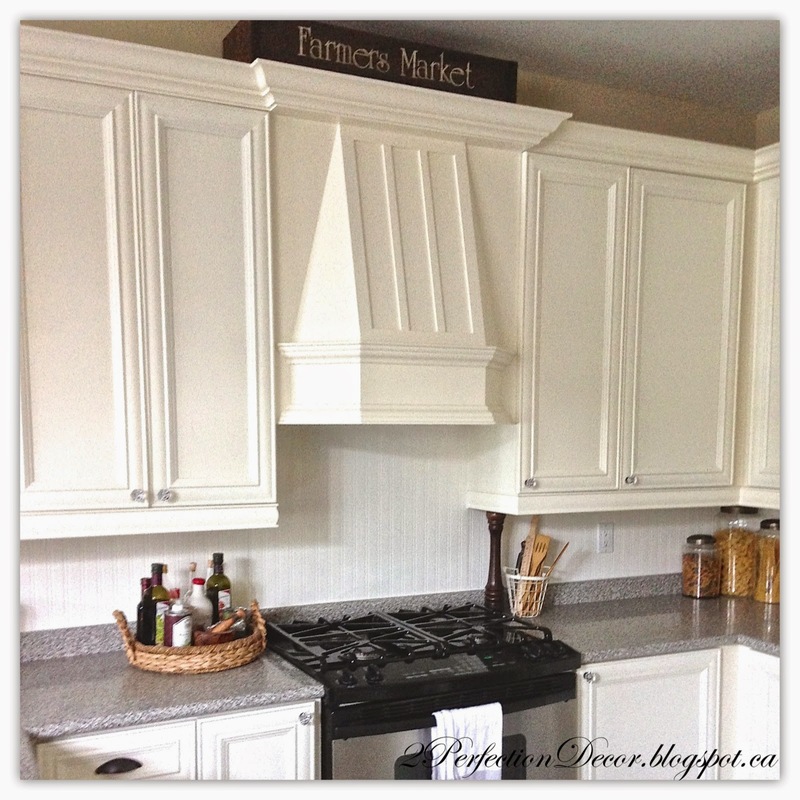 The previous Mirrored backsplash got covered with white beadboard wallpaper.. Yes wallpaper!! Plus who wants to smash a mirror and possibly get 7 years bad luck! .. not me!! The wallpaper covered the mirror great, you would never know.. 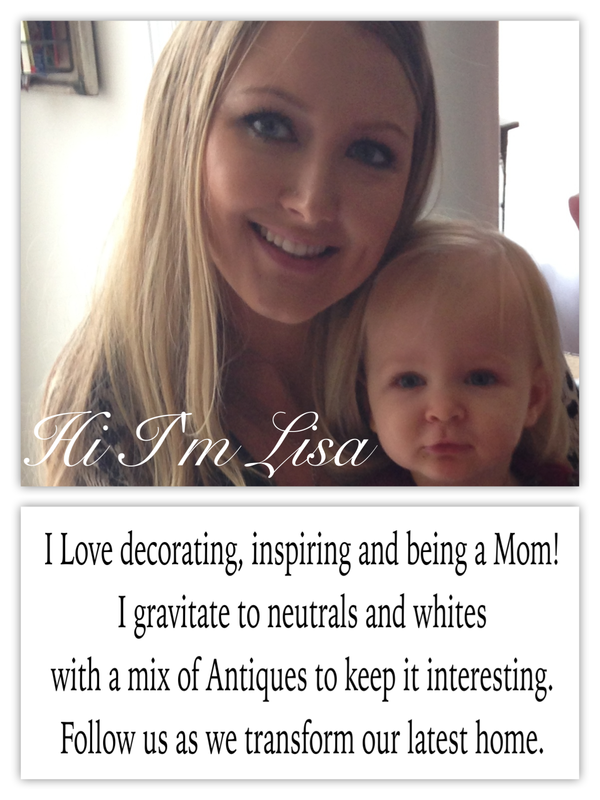 I have used beadboard wallpaper before in our previous home. Its super durable. 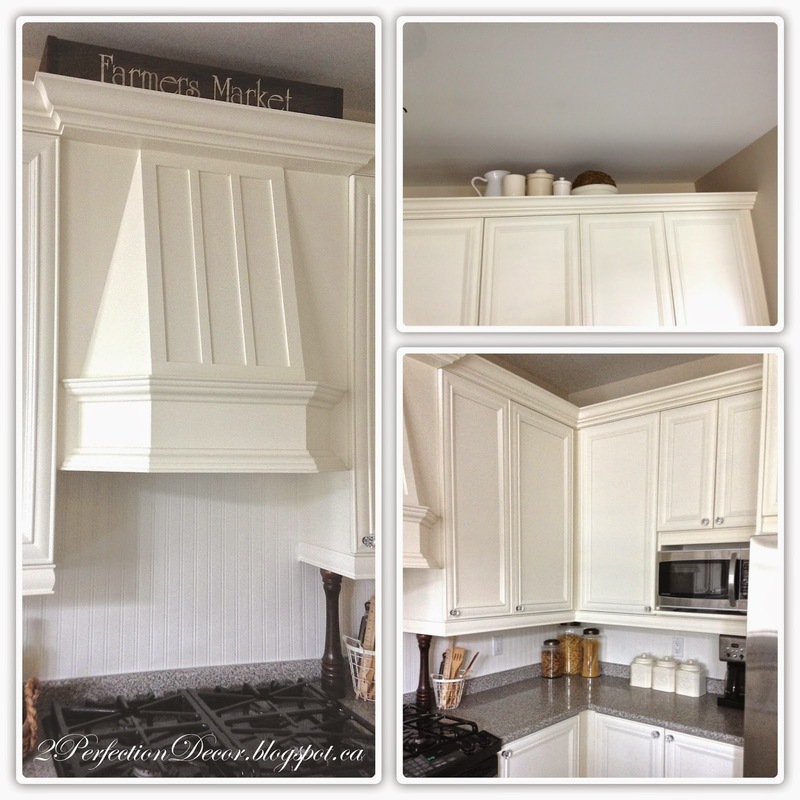 I painted it in Benjamin Moore Cloud white to make it look more finished. 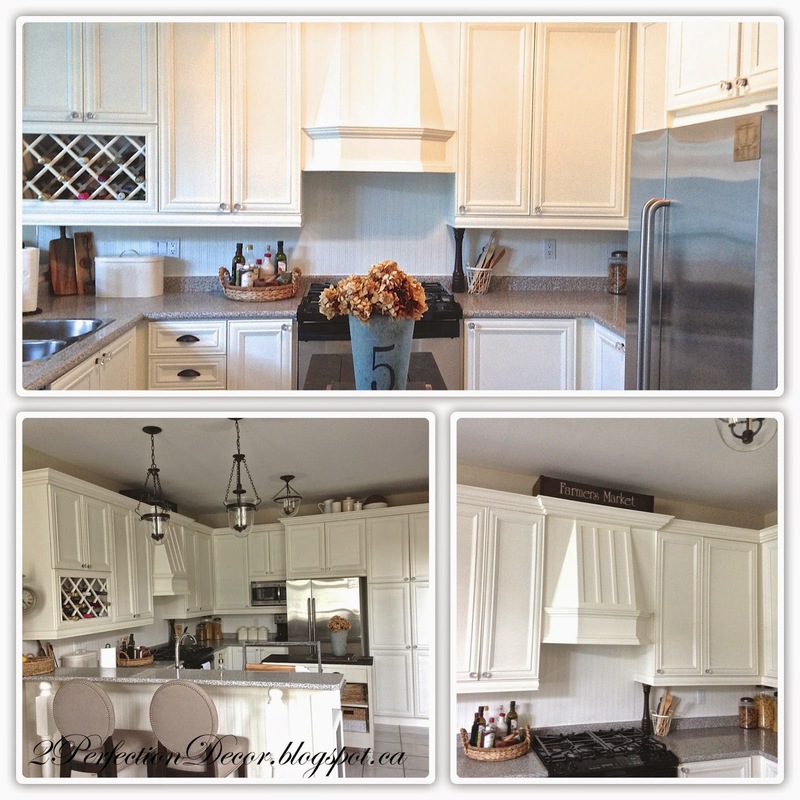 The cloud white flows but its not too matchy matchy with the cabinets. We kept the laminate counter tops due to budget restraints but I feel like they look better already with the new painted cabinets. This was a ready-made moulding we bought at Rona. 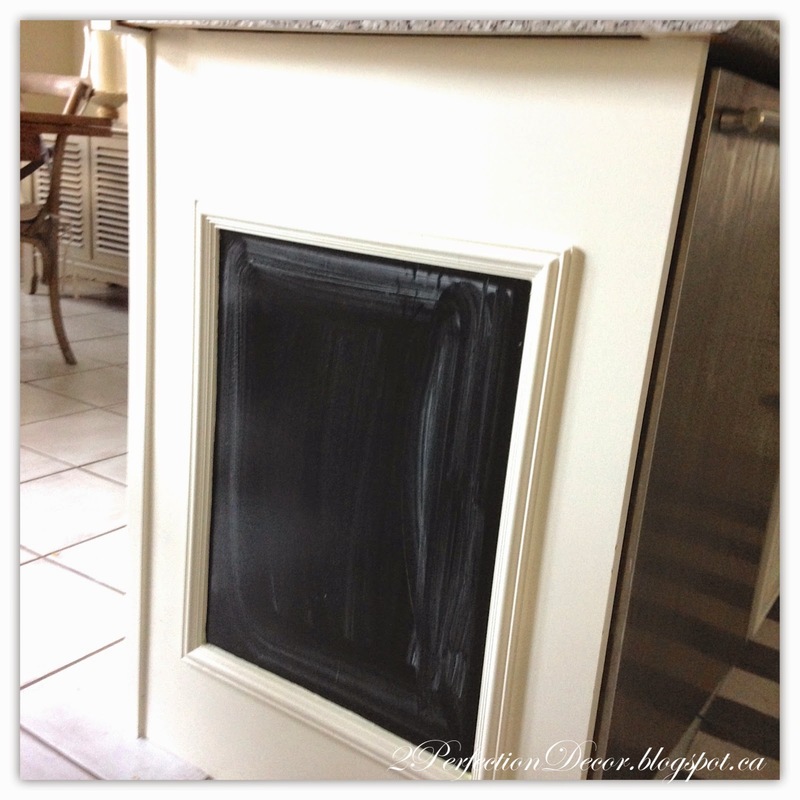 We painted the inside with a little bit of left over chalk board paint and our daughter loves it!! The hardware got changed out for the Restoration Hardware Crystal knobs from our previous kitchen and added Oil rubbed bronze pulls from Home depot on all the drawers. 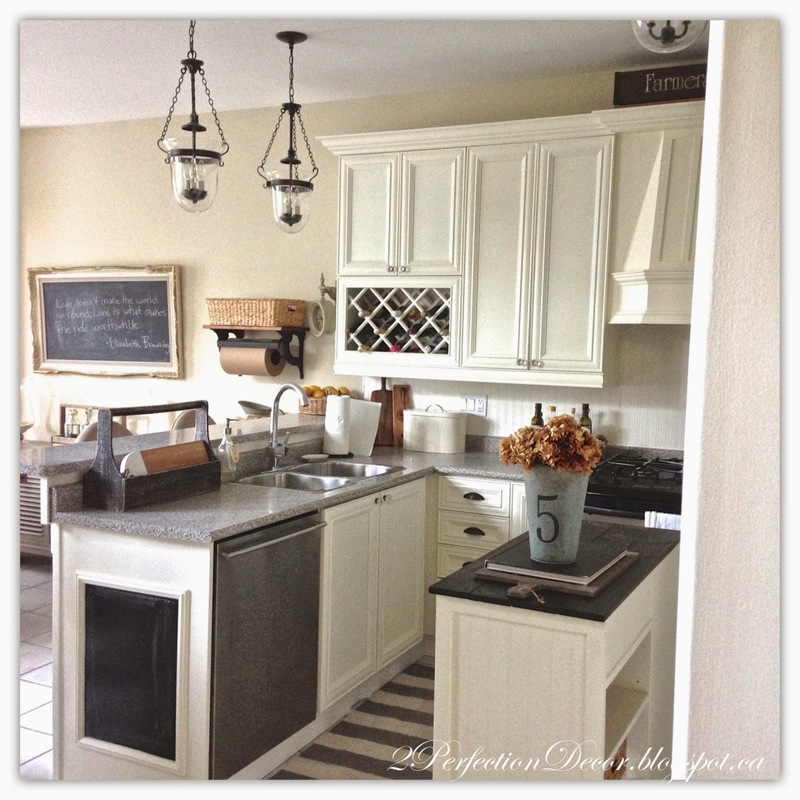 The main kitchen ceiling track lighting got switched out for a more traditional semi flush mount hurricane light from Pottery Barn.. It was a splurge! But well worth it.. Lighting makes a huge difference not only in the look of a space but also in the functionality. 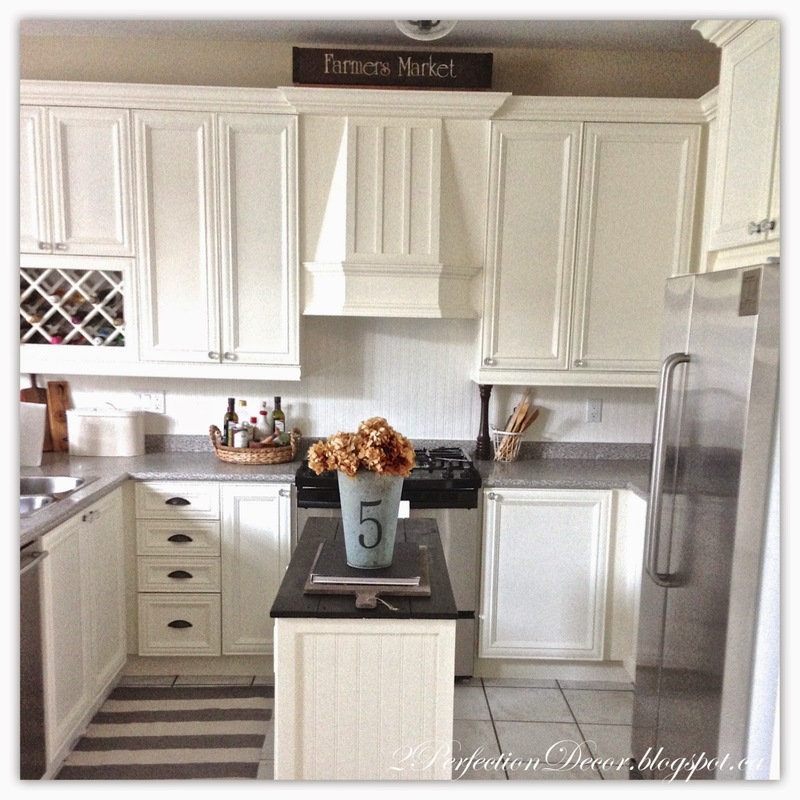 Labels: beadboard backsplash, benjamin moore linen white, budget kitchen, cream kitchen, easy kitchen tweaks, french country kitchen, large crown moulding, painted cabinets, white bead board, white kitchen ideas. 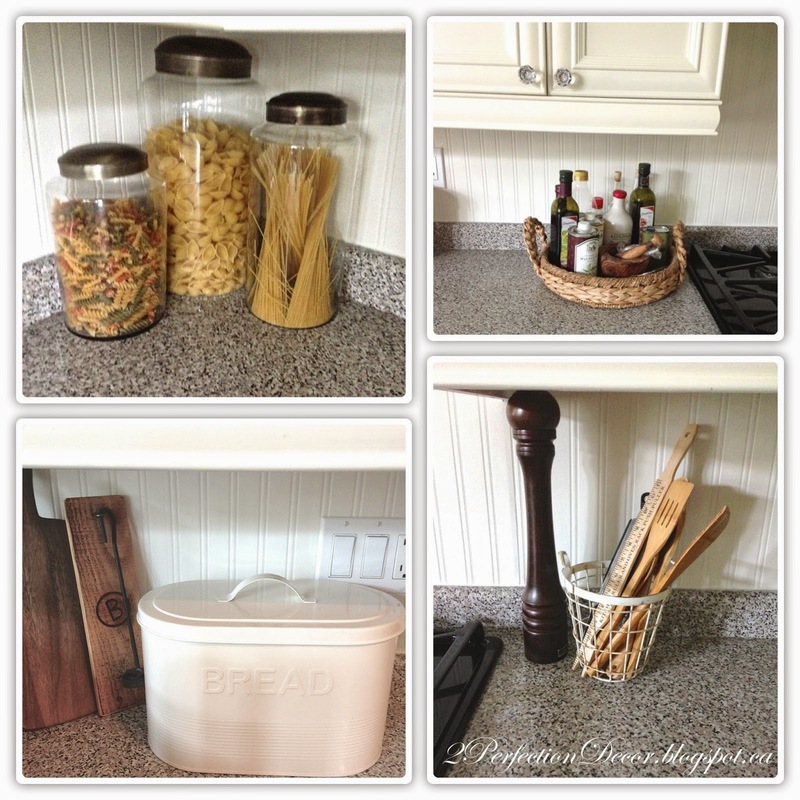 Your kitchen is so beautiful!! I especially like what you did with the hood. Thank you so much. 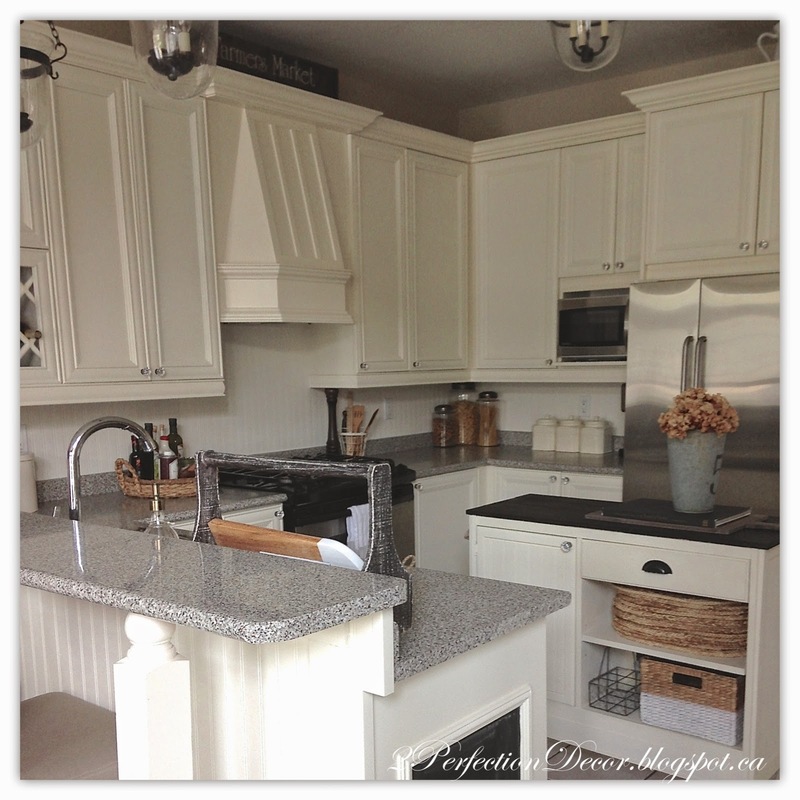 If you like the hood then I think you might like my next post... Our island transformation! Let me know what you think. Our New House Preview.. & all the Plans! Fall themed Harvest Table Find!